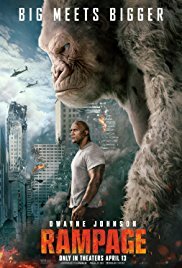 Tony's Talking Pictures Blog: New in Theaters April 13, 2018 "Truth or Dare," "Beirut" and "Rampage"
New in Theaters April 13, 2018 "Truth or Dare," "Beirut" and "Rampage"
What begins as a harmless game of Truth or Dare among friends, turns deadly when someone or something, begins to punish those who tell a lie or refuse the dare. 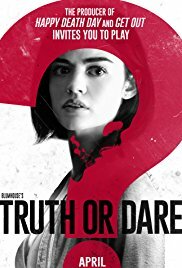 “Truth or Dare” should have been so much better, especially coming from the folks who were behind “Get Out,” and the “Purge” series. The film is a paint-by-numbers approach to horror film making, with absolutely no artistic flair whatsoever, leaving the audience with a bland, unsatisfying and totally forgettable film experience. “Truth or Dare” is not worth your time to see. Caught in the crossfires of civil war, two CIA operatives must send a former U.S. diplomat to negotiate for the life of a friend he left behind. “Beirut” is falling under some heavy scrutiny since it wasn't filmed on location and it is not historically accurate. Taking that into consideration, I found the film to be a better-than-average thriller. Both John Hamm and Rosamund Pike are extremely watchable in this fast-paced story about a missing agent and the attempt made to rescue him. In the end, “Beirut” is a film about friendships and cultures and the price paid for diplomacy and political gain. 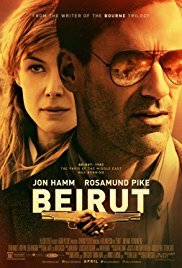 “Beirut” gets a B and is rated R.